See all Ragdoll characteristics below! In the family of cat breeds, Ragdolls are among the younger siblings. The cats were first developed by breeder Ann Baker in Riverside, California, in the 1960s. Baker’s foundation stock consisted of Josephine, a domestic longhair whose white coat concealed the genes for either a seal mitted or black tuxedo pattern, and various other longhaired cats of unknown ancestry that she owned or found in her neighborhood. Baker selected for cats with gentle, placid personalities, large size, and beautiful long coats characterized by a Himalayan pattern, the name for the “points” seen on Siamese-type cats. The result was a cat she called the Ragdoll, for its propensity to flop happily into the arms of anyone who picked it up. Later, Persians, Birmans and Burmese may also have contributed to the Ragdoll’s development. Baker made many unusual claims about the cats’ development, including alien influence, CIA experiments, and infusions of human genes, but that is all they are: claims, with no basis in fact. Other people had begun breeding Ragdolls as well. They broke away from Baker and formed the Ragdoll Fanciers Club International, with the goal of standardizing the breed and achieving recognition by cat registries. The Cat Fanciers Association began registering the cats in 1993 and gave them full recognition in 2000. Most registries now recognize the breed, including the American Cat Fanciers Association and The International Cat Association. Ragdolls are not outcrossed to any other breeds. Females usually weigh 10 to 15 pounds, and some males weigh more than 20 pounds. Unlike many cats, Ragdolls are notable for collapsing into the arms of anyone who holds them, even if they are cradled on their back. They love their people, greeting them at the door, following them around the house, and leaping into a lap or snuggling in bed whenever given the chance. They often learn to come when called or to retrieve toys that are thrown for them. The word most often used to describe them is docile, but that doesn’t mean they are inactive. They like to play with toys and enter into any family activities. With positive reinforcement in the form of praise and food rewards when they do something you like, Ragdolls learn quickly and can pick up tricks as well as good behaviors such as using a scratching post. In a small, sweet voice, they remind you of mealtime or ask for petting but are not excessively vocal. Ragdolls have nice manners and are easy to live with. You will find a Ragdoll on your sofa or bed, but generally not much higher than that. He prefers to stay on the same level with his people rather than the highest point in a room. Hypertrophic cardiomyopathy, a form of heart disease that is inherited in Ragdolls. A DNA-based test is available to identify cats that carry one of the mutations that causes the disease. A Ragdoll’s moderately long fur has little undercoat, which means it is less likely to mat and shed, but that doesn’t mean the cats need no grooming. Comb it twice a week with a stainless steel comb to remove dead hair that can cause tangles. Be sure to comb the fur on the legs thoroughly, especially where the leg meets the body, where mats are most likely to occur. A rubber curry brush will smooth the fur after you comb it and remove any remaining loose hairs. If you are gentle and don’t pull their hair, Ragdolls will love the attention they receive from you during grooming time. Note that seasonal changes as well as hormonal fluctuations in unaltered cats can affect the length of the coat. The coat will be at its peak in winter. Ragdolls that have been spayed or neutered will usually have a lush coat year-round because they lack the hormonal fluctuations that occur in unaltered cats. Check the tail for bits of poop stuck to the fur and clean it off with a baby wipe. Bathe a Ragdoll as needed, which can range from every few weeks to every few months. If his coat feels greasy or his fur looks stringy, he needs a bath. Brush the teeth to prevent periodontal disease. Daily dental hygiene is best, but weekly brushing is better than nothing. Trim the nails every couple of weeks. Wipe the corners of the eyes with a soft, damp cloth to remove any discharge. Use a separate area of the cloth for each eye so you don’t run the risk of spreading any infection. Check the ears weekly. If they look dirty, wipe them out with a cotton ball or soft damp cloth moistened with a 50-50 mixture of cider vinegar and warm water. Avoid using cotton swabs, which can damage the interior of the ear. Keep the Ragdoll’s litter box spotlessly clean. Cats are very particular about bathroom hygiene, and a clean litter box will help to keep the coat clean as well. Speaking of litter boxes, a large cat like the Ragdoll needs a box that is super-sized to ensure that he has plenty of room to turn around and squat. Ragdolls usually go through several growth spurts as they mature. These can continue off and on until the cat is four years old. Don’t be deceived by the pad of fat on the belly, which is a trait of the breed. Until you are sure they have reached their mature size, make sure they always have plenty of food available to fuel their growth. It’s a good idea to keep the gentle Ragdoll as an indoor-only cat to protect him from attacks by dogs or coyotes, diseases spread by other cats, and the other dangers that face cats who go outdoors, such as being hit by a car. Ragdolls who go outdoors also run the risk of being stolen by someone who would like to have such a beautiful cat without paying for it. Ragdolls stand out for their large size, semi-long coat in a pointed pattern, and sparkling blue eyes. They are among the largest of the domesticated cats, with some males weighing in at 20 pounds or more. A Ragdoll has a light-colored body with a darker face, legs, tail and ears. He comes in three patterns: mitted and bicolor, both of which have white, and colorpoint, which has no white. Ragdolls don’t reach their full size and coat development until they are three to four years old. 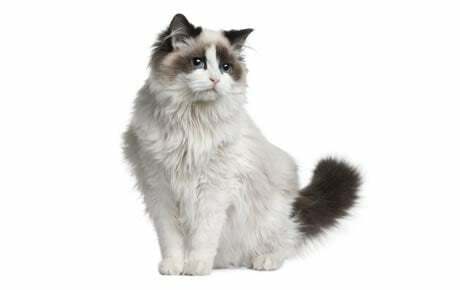 The Cat Fanciers Association breed standard says the Ragdoll should have a large, broad head in a modified wedge shape. All sides of the head should be of equal length and the muzzle should be gently rounded. The eyes are described as vivid blue ovals. Medium-size ears have rounded tips and tilt forward. Supporting the head is a heavy, strong neck, which segues into a large and long body that is broad, solid and heavy-boned. The heavy-boned legs are moderately long, with the hind legs longer than the front legs. Large round paws are tufted with fur, and the long tail looks like a waving plume. The Ragdoll has a silky coat that is moderately long. It’s short on the face, blossoms into a ruff around the neck, shortens again on the shoulder blades, then lengthens toward the tail, which is fully feathered with fur. Depending on the association, the coat comes in four patterns--bi-color, van, mitted and colorpoint—up to six colors: seal, blue, chocolate, lilac, red, and cream, and points that may be solid, lynx, tortie, or torbie (tortie and lynx). That adds up to many different possibilities when it comes to color and pattern. Mitted Ragdolls are just what they sound like: they have four white feet, plus a white chin and belly, and sometimes a white spot on the face that may look like a blaze, star or hourglass. Bi-colors have even more white than mitteds, including on the chest and belly and sometimes on the back. On the face they may have a white inverted V-shape. Vans have the most white on the body, and Colorpoints have no white. Ragdolls sold as pets may have slight cosmetic imperfections that make them unsuitable for the show ring. These might include ears set higher on the head than preferred, a nose that doesn’t turn up at the tip, eyes that aren’t Crater Lake-blue, or maybe mitts that don’t go up high enough on the hind legs. As long as they have the sweet, loving Ragdoll temperament, none of that really matters for a cat who will be a beloved companion instead of a show-ring star. The laidback Ragdoll is perfectly suited to family life. He rarely extends his claws when playing, and he usually doesn’t mind playing dress-up, riding in a baby buggy or being a guest at a tea party. Because of their large size, males are an especially good choice for families with children. Of course, you should always supervise young children to make sure they don’t torment the cat. And with a cat this size, it’s essential to teach children how to support the cat, with one arm beneath the front legs and one beneath the hind legs. Never hold a Ragdoll with the hind end hanging down. He is happy to live with other cats and cat-friendly dogs, too, thanks to his amiable disposition. Introduce pets slowly and in controlled circumstances to ensure that they learn to get along together.